This book is about quantum "reality" not just quantum theory. Nick Herbert is quite emphatic in the distinction he makes between the two. The Clauser confirmation of the Bell Theorem lies in the area of quantum fact ("reality") and would continue to be a fact regardless of whether some new theory were to replace quantum theory. What is the Bell Theorem? If you've a yen to know more about it, you've come to the right place. Herbert's book builds up in the reader a basis for understanding his exposition of the famous theorem, then creates a simple Blue, Green experiment to demonstrate it. In essence, he leads us to see that the results we get when we rotate the Green photon detector 30 degrees depends upon whether the Blue photon detector is rotated 30 degrees or not. And the two detectors may be thousands of millions of miles away! This incredible result was predicted by quantum theory, but was scoffed at, since it requires the communication between detectors be faster than the speed of light - instantaneous, in fact. Being unwilling to accept that possibility, physicists have demonstrated classical symptoms of psychological repression towards the Bell Theorem: avoidance and discounting. 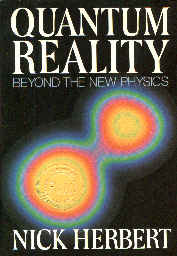 Since most physicists are phenomenologists they are concerned with the phenomena created by reality, not reality itself. The Bell Theorem deals with the nature of reality, so physicists have safely ignored the troublesome theory in the laboratory and have created plausible alternate explanations for its effects, e. g., the idea that it is due to disturbances in measurement. Herbert himself admits to using the disturbance explanation to satisfy himself for many years, but admits in this book that the disturbance model is not sufficient to explain Bell's Theorem. John Stewart Bell has created an unassailable theorem that transcends quantum theory. It creates a necessary new of reality in which the world is as John Cowper Powys describes in A Glastonbury Romance, "when a step down from an afternoon commuter train resonates with disturbances in a far off galaxy" -in a dance of the near and the far that seems incredible except that just that kind of ultimate reality is required by this theorem and its corroborating experiments. This is a book that makes the Bell Theorem accessible to scientist and laymen alike in a clear, concise exposition and should be in both's libraries.